So as I have mentioned before, I don't like DEET. Chemicals are not my friends, not even when it comes to cleaning the bathtub. So why should I resort to chemicals for insect repellent? That's a no no. Plus I have this sweet little baby girl with the most beautiful soft skin and chubbiest cheeks. She does not deserve to be doused with chemicals either. That's where Badger Anti-Bug Balm comes in. We went on a weekend trip to the Berkshires and this came in so handy. 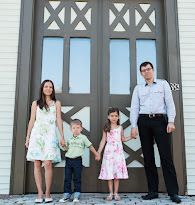 We took strolls with the babies in the evening, we dined outdoors after 6 pm. Plus it was in the upper 80s and very humid the whole weekend, so wearing something long sleeved for the night was not an option because it was the only time to enjoy the weather once the heat subsides. 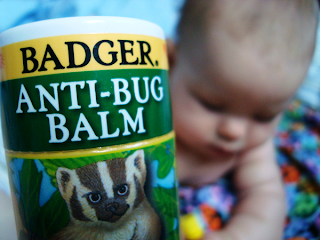 I applied the Anti-Bug Balm liberally on the baby, she had no bites. My husband and I had a couple though since we used it more sparingly on ourselves. Yeah, that's what happens once you become a parent. Here is my take on this nifty little blend of insect repellent. EFFECTIVENESS: Like I said above, this stuff really works. 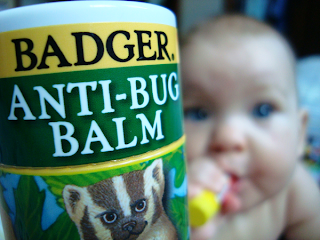 I am often skeptical of 'natural' repellents, but Badger is true to its word. 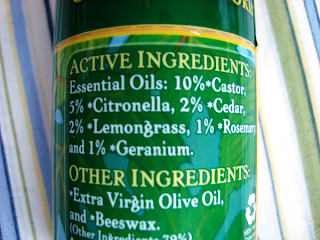 You do have to reapply it every couple of hours, but that is true for any insect repellent. The mosquitoes were all around but did not land. You want to put this on in key spots like neck, ankles, shoulders, inside of the elbow and knees. I also put some on my temples because they always bite my face. No bites anywhere but one on my leg. I shared this with others and on one particular evening when I put this on my daughter another baby did not wear it and actually had many bites visible the next day. I don't take any chances! PACKAGE DESIGN: I have the push up stick and I find it very convenient to apply as you don't have to get your hands greasy. It is a lot like lip balm, just a bigger and fatter stick that you push up from the bottom instead of twisting for it to come out. It is small enough to keep in my purse or in the diaper bag so no matter where I go with my baby girl I can whip it out. INGREDIENTS: Not just harmless, but actually good for your skin. Organic is a plus! It does feel a little greasy when you apply it, although that didn't bother me at all. You can rub it in if you want to, but I just applied with the stick and left it as is. This blend of plant oils smells so delicious and sweetly citrus, I find it refreshing. PRICE: I think that $10 is a good price for this product. By the looks of it, it will last a really long time. At least you are not paying money for toxic chemicals but ingredients that are actually good for you. COMPANY: I was really excited when I found out that Badger products are made in New Hampshire, the border is just a ten minute drive from my house! For me that is as local as it gets. I like buying local whether it is a product or farm fresh produce. Although even if I lived on the west coast, this little magic wand is worth the CO2 produced in transit. What matters though is not that it is just local, but it is a small family owned business that engages in environmentally responsible practices. That is a +5 in my book! I'm inspired, I want to start a business like that, hm, only what would I make? They even have a Babies at Work policy where the mother can bring an infant to work with her for the first six months of the baby's life or until the baby starts crawling. Now if that is not cool, I don't know what is! You can read more about it on their website. If you want to know how green the company is you can also find that there. EcoMama Green Factor: +5 Green company, green product, enough said. Read this review on Lunch.com! A friend of mine bought this because her beloved dog licks her. She wanted an insect repellent that wouldn't poison her dog. We slathered this stuff on, then spent three hours as evening fell by the side of a river. Neither one of us got a single bug bite. After a first, 'wow, that's aromatic' we adjusted to the smell until it was pleasant instead of overpowering (2 people with it slathered on, 3 more with it dabbed on, all in one enclosed space - the car = overwhelming smell of anything). 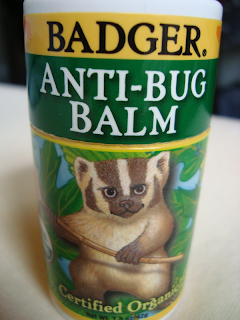 I heartily recommend every Badger balm that I have tried. The headache soother has cut down on the amount of OTC pain killers that I consume, for example. I am curious what Ola will do about that.